Robert Englund participated in a Q&A session at the Mad Monster Party 2018 horror convention on Feb. 17 in Charlotte, NC, where he revealed his favorite Elm Street film and how his real life jealousy of original Nightmare co-stars Johnny Depp and Heather Langenkamp actually helped him get into character as Freddy Krueger. 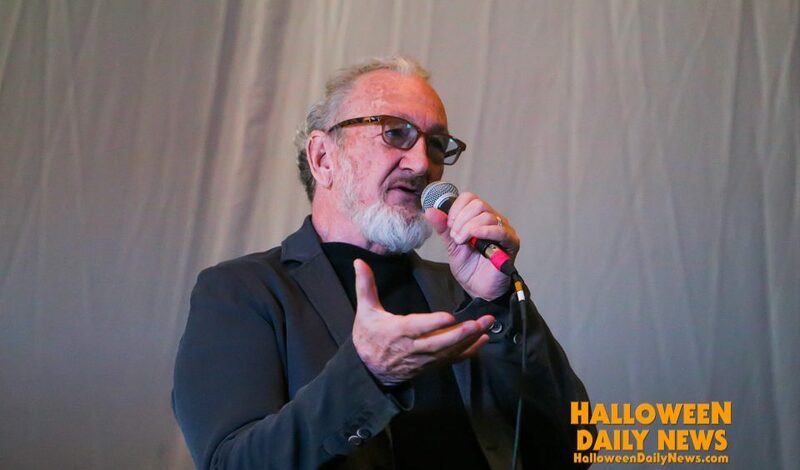 Read on for our recap of all the highlights from Robert Englund’s Q&A at Mad Monster Party. Johnny and Heather came in one morning, and both of them looked like they had complexions made of morning dew, they were so beautiful. I remember it was a really hot summer day in Hollywood, and we were in the old I Love Lucy makeup room at Desilu Studios. I had been up since four in the morning, working since seven. They’re touching up the Freddy makeup and they’re basting me with a turkey baster with vaseline so that I catch the light. And in walked Johnny in his rockabilly clothes and little dutiful Heather, and they sit down in these really comfortable makeup chairs that are like old padded barber chairs. They’re getting their makeup on, and I remember looking over at them, and I’m getting stuck with this sticky, rough brush, they’re poking at me and they’re basting me like a turkey in the oven. And Johnny and Heather are getting makeup on, like they need makeup, they’re so beautiful. Then the makeup girl gives them both a little tiny plastic, battery operated fan to keep them cool. I’m itching like I’ve got poison ivy, and they’re sitting there with their little fans whirling. And I got really upset mentally. I thought, ‘Robert, why are you doing this damn movie? Look at them, they’ve got their whole careers ahead of them, they’re young, they’re beautiful. Maybe you’ve made the wrong decision taking this part.’ I had all this envy for their youth and for their beauty. I went, ‘Wait a minute. I can use that. That’s something Freddy can do. Freddy hates youth and beauty and children. Freddy kills children. Freddy is a child killer. What is killing a child? It’s killing the future.’ So that very real moment that I had full of envy and resentment for Johnny Depp and Heather Langenkamp became that little synapse, that little go-to memory that I could use every time I had to get angry as Freddy with the young people on the set. The other thing is, I walked by a mirror very early, and the original glove was quite heavy, and I realized that I was standing with my arm down kind of low and my should dropped because of the weight. I said, ‘What does that remind me of?’ And I said, ‘Oh yeah… (motions drawing a pistol), a gunslinger.’ So then, now that I had that revelation, I would work it a little bit, I stood a little bit like a gunfighter and I held the claw like it might be a gun. So that became part of physicalization. I also borrowed a little bit from Jimmy Cagney, who was in all those gangster movies of the ‘30s and ‘40s. He would stand with his legs kind of wide, so I used that sometimes when I knew I was far away from the camera. And I’m a fan of (theater choreographer/director) Bob Fosse, and he uses asymmetry. That’s his whole style. It’s never even. It’s always asymmetrical. So I used a little bit of that with Freddy and tried to make Freddy asymmetrical, because of the big claw, because of one shoulder being lower. Whenever I was on a set, I tried to have Freddy positioned or somewhere asymmetrical with his body language. And that became just something that I used a lot. They’re weird things that actors latch onto – Bob Fosse, being jealous of Johnny Depp and Heather Langenkamp, gunslinger, Jimmy Cagney, all mashed together. But all those things together really worked for me and were kind of like little resting points that I could use for the character. The hours were crazy. It was three and a half to four hours just to get ready, and then you work a 14 hour day at least. See if you don’t get your eight hours of sleep, that’s a Union thing in your contract, they have to pay you extra money. You always give the company a couple of those. It’s called turnaround. You give them a couple of nights where you don’t really get your eight hours of sleep before you have to be back at work. You’re always generous, because things can happen. And I did that a little bit for them, but I need that eight hours of separation. It was rough. All of the Nightmare movies, and I’ve done eight of them and a TV series, that’s a lot of makeup. On the movies we really worked a lot. Nightmare 4 is my favorite performance of mine. I think the fan favorite if you took a vote is Nightmare on Elm Street 3: Dream Warriors, which has this amazing cast, with Patricia Arquette, who has an Oscar now, Laurence Fishburne from The Matrix, Heather. It’s a terrific cast and just a wonderful, magical movie. My favorite of all the movies is Part 7, Wes Craven’s New Nightmare, because it’s the purest Wes expression, and it’s a movie we made for you guys. It’s a movie made for the fans. By that time, we had begun to experience the love and the feedback, I had gone to a couple comic cons by then, and we were beginning to experience that the horror and the science fiction and the fantasy fans were beginning to become the power players that they are now in the industry. Now every week you have a fantasy or horror or science fiction movie in the top 10, but for many years, you fans and our movies were relegated to the table by the kitchen. (laughs) We didn’t get the cool table. We didn’t get to sit with the cool kids. And now there would be no cool kids if it wasn’t for the money we generate. In fact an entire studio (New Line) was built on the Nightmare on Elm Street films. They (genre films) have sort of become the go-to program now in Hollywood. It’s like how the western used to be, or war movies, or for a while gangster movies were like that. People also forget that in the ‘30s and ‘40s, women were the biggest stars. There were huge female stars, and they made all the money in Hollywood and they made Hollywood run. It went away for a while, but I think it’s coming back again, and that’s a good thing. It’s important, especially behind the camera. I don’t know. I certainly don’t want it to be Freddy vs. Chucky, get that little son of gun out of there. (crowd laughs) I always thought it would be interesting to mash-up Freddy and Michael Myers, or, the one we almost made but New Line was sold to Time Warner, we were actually close to getting the green light for Freddy vs. Jason vs. Ash. That was fun. We were out in the deep north end of the San Fernando Valley, where they used to make all the westerns. In the recession, there was a bunch of industrial buildings out there and they went out and converted them all into soundstages. All you had to do was soundproof them, because there’s no airport out there, so it’s really quite. The floors of real soundstages are wood, and the floors of industrial buildings are concrete, and we were shooting on concrete in winter. It snows out in that part of southern California. I remember we did it over and over again, because each member of Dokken has to have a close-up and a single (shot) and an art angle, and then they had to fit me into it. It was a long night. And I think those guys all got terrible colds, because on that concrete they were wearing their little rock and roll boots. I think they all got like shin splints and colds, because they had to stand there for hours on that cold concrete. Professional dancers are Union and they have to dance and rehearse on wooden floors. You want to have little bounce to it. You just can’t go jumping and leaping on concrete or asphalt. You can really wreck your bones in your leg. So it’s tricky. You’ve got find the right venue for that stuff. We did not find the right venue for the Dokken video. You know what’s crazy? When I wrote my book, Hollywood Monster, I went to the site where you can find song lyrics, and I typed in “Freddy Krueger,” and like 500 songs came up – Lil’ Wayne, Jay Z, Eminem, obviously Will Smith, that’s one of the early ones. I couldn’t believe all the people that referenced Freddy Krueger over the years. But I never got to meet Will. That’s not me (in the song). I never met Will or DJ Jazzy Jeff. And I’d like to. I’m a big fan of Will Smith’s. No, that’s not me. I’m in the Fat Boys (“Are You Ready for Freddy?”). I’m in the first rap video, which was the Fat Boys. I actually tried to do like an Abott and Costello meet Frankenstein kind of movie with those guys, because those guys are very talented and very funny. But I think they had problems with their manager, and there were internal conflicts within that group, and they didn’t last. But they were terrific and fun to work with. I am the Scarecrow in Injustice 2 and I’m in many other games, and I’m the voice of Freddy in the now highly collectible Gottlieb pinball machine, but I’m not (in) Mortal Kombat. That’s not me, and I think they regret it now. But I like the Mortal Kombat. I think it’s a great game. But if you want to hear me shred, check out Injustice 2, because I throw down with everybody from Harley Quinn up. I’ve directed a couple of movies and maybe five or six television shows. I’m a director but I’m not really a film director. I’m a theater director. I’m great with casting and the art department, I’m okay with camera, but I’ve been a gun for hire as a director. They always want me to do a horror movie, and as much as I love horror movies, there are always special effects in horror movies, and they can go very wrong. You’re always fighting the clock when you’re a director in movies. You don’t fight the clock in the theater. But when you’re doing a movie, every day it’s just tick tock, tick tock, money, money, money, fast, fast, fast, get it done, get it done, all these incredible pressure situations that occur. It’s a constant stomach ache. You think you’re going to love the shooting, but you’re on the clock then. Pre-production can be fun. I like casting. But there’s so many needless meetings that you have to take that don’t really come to fruition. I like post-production. There’s nothing more wonderful than editing the movie, and you’re sitting there and you’re tweaking it and playing with it. You have a scene that doesn’t quite work, and then you put in a train whistle in the background or the sound of sprinkler on a lawn, and it makes the scene come alive. It’s just fun to play, because you feel like you’re sort of like a mad scientist, just enhancing this world that you’ve shot five or six months ago, and now you’re re-examining it, and you also get to shuffle it. You can change it. You can put your beginning in the middle or put your ending at the beginning. It doesn’t have to be two and two equals four. It can be one plus one plus one plus one equals four or it can be three plus one equals four. You can rearrange what you’ve shot, and that’s really fun too. The real secret of movies and film, the really great movies are always playing with time, how we deal with time, how we process time, and when you direct, you really get to experience that. I don’t think I’ll direct another movie. It takes a year of your life at least, with pre-production, financing, casting, shooting, and then post-production and publicity. I’ll probably direct some theater again. There are a couple plays I want to direct. I’m getting too old to just sort of give up a year of my life to a project. When you’re an actor, my biological clock is so tuned to being six weeks in and out or eight weeks in and out or 10 days in and out, and I really like that rhythm of preparation and execution. And then I can wash my hands of it. If you like Lyn Shaye in Insidious, she really rocks in Midnight Man. It’s very traditional don’t-play-that-game horror movie. Then I have a little strange kind of Twilight Zone one called Nightworld. It’s about a portal to purgatory that becomes unsealed somewhere in Eastern Europe. I’m blind and old, and they bring me out of retirement because I used to be the night watchman for the portal and I’m supposed to save the day. And I just got back from Spain where I worked on a virtual reality project, a narrative, storytelling, 360 degrees, ghost stories by a campfire with little kids at summer camp, and then from the campfire we go into the ghost stories. After every take there was a 45 minute break, because there were 11 lenses on the camera, and each one of them you have to check the electrical feed, you have to re-clean them, and then you have to look at the playback for 11 different angles. It’s a real new way of acting and keeping yourself kind of on simmer. But it’s really fun, because you can walk behind me. At one point, you literally go underground and into an ant cave. I play the Skull Collector. It’s called Campfire Creepers and it’s going to be fun. I think short virtual reality films are going to be the future, along with gaming. You can’t do it very long, but I think a nice little eight to 10 minute segment is just about right for little short ghost stories, like little Twilight Zones really lend themselves to the VR experience. You can view some of our photos and a video clip from the Q&A below. Funko Announces Classic Horror Mopeez!